In many parts of regional Victoria, roadside vegetation is some of the most valuable remnants of the original landscape. Many are reservoirs of biodiversity and habitat for animals and act as corridors to larger areas of bush and conservation reserves. They also add beauty and character to our landscapes. Yet across the state, valuable vegetation is being destroyed by VicRoads, by local Councils and other land managers. A growing number of communities are starting to actively oppose this destruction. These groups understand the need to upgrade the road system to modern standards and make roads safe for users. Yet they also believe that VicRoads is placing engineering ‘needs’ above landscape protection. In many instances there are alternatives to vegetation destruction. 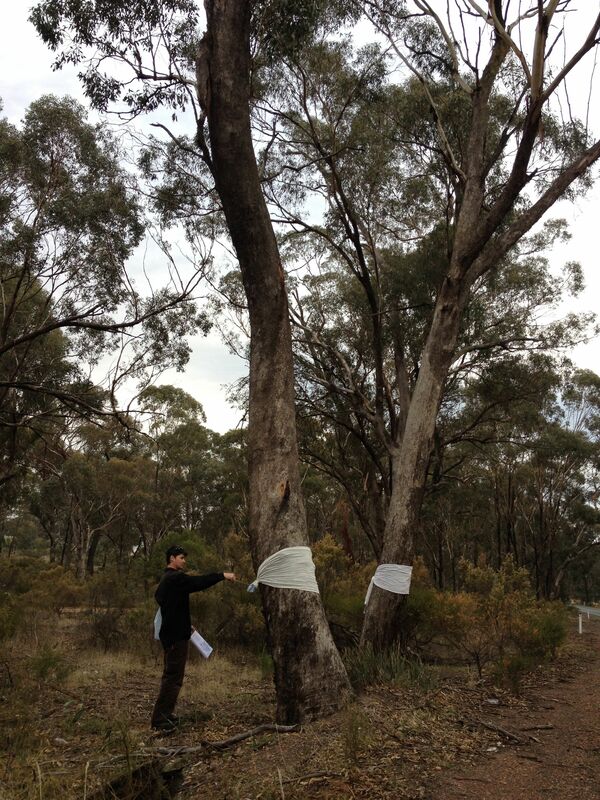 Marking trees which will be cleared by VicRoads with white bandages. This is a quick, inexpensive and easy way to show the fated trees. VicRoads only marks them with a small dot at the base of the tree. Rushworth. Image: RAGE. These groups are getting organised and getting active against this widespread destruction. They are demanding that the state government intervene and halt further clearing until there has been a thorough assessment of the ecological costs of current practices. A growing number of communities feel they are being ignored by VicRoads or channeled into consultation that goes no where. This collaboration has been initiated by Western Highway Alternative Mindsets (WHAM) and Rushworth Action Group for the Environment (RAGE) with the support of Friends of the Earth (Melbourne).